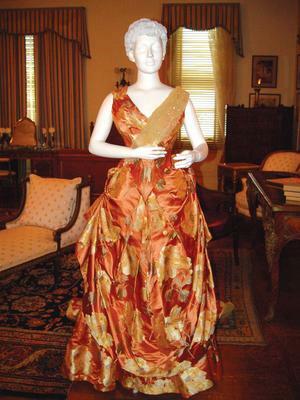 Any of my lucky readers who have a chance to visit Newport this spring must stop by Rosecliff (the home of Tessie Oelrichs) for The Preservation Society of Newport County’s costume exhibit “Newport Undressed: Crafting the Gilded Age Wardrobe”. This gown designed by founding father of couture fashion Charles Frederick Worth was worn by Ella King, who lived at the Kingscote mansion in Newport in the mid 1800s. An intern from the University of Rhode Island’s graduate textile program spent close to 80 hours restoring its beaded sash. The exhibition explores all aspects of the dressmaking process. Among the highlights are gowns worn by Ella King of Kingscote and Ellen French, the first wife of Alfred Vanderbilt of The Breakers. A circa 1880 gown by Paris designer Charles Frederick Worth will be displayed completely inside-out, allowing visitors a rare opportunity to view its elaborate internal construction. The exhibition includes ten dresses plus various accessories. The well-to-do Gilded Age woman had several options when purchasing clothing. She could commission garments from private seamstresses, or purchase read-to-wear items from department stores and boutiques. But the pinnacle of high-end shopping was the Parisian haute couture house, which created fashion that was as costly and expertly-crafted as fine art. The Parisian houses of couture, which were supplied with expensive silk crafted predominately in nearby Lyon, France, rarely created entirely custom pieces. Instead, ladies met with the designer, though more often a “vendeuse” (salesperson) and selected from a group of designs that were then customized with fabrics and detailing and fitted to the customer’s measurements. Each fashion house was backed by a huge staff that filled hundreds of orders per week. Most important were the seamstresses, who spent hundreds or even thousands of hours hand-stitching each unique garment. These designer garments could range in cost from $100 to $500-the equivalent of approximately $3,000 to $13,000 in today’s currency. The exhibit is curated by Urick, and will be on display in the Lesley Bogert Crawford costume galleries on the 2nd floor of Rosecliff through November 19. 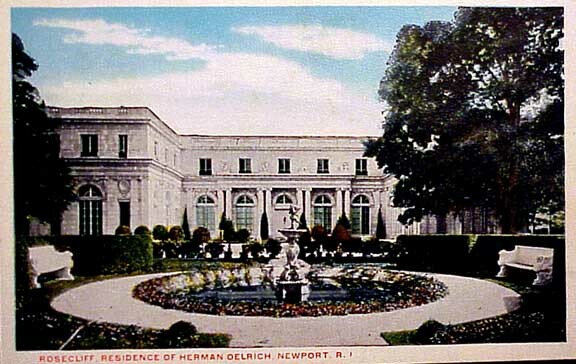 Admission to the exhibit is included with any Rosecliff tour ticket. I agree! These gowns and the gorgeous cottages in Newport make me hanker for a good costume drama set in America. Unlike Britain, there seems to be a healthy disdain for period films in Hollywood. I didn’t make it to see this exhibit but I saw one the year before In Vogue: Newport and the American Fashion Press. They had gorgeous Gilded Age costumes on display. My favorite mansion was always Astor’s Beechwood which featured actors portraying the family and friends of THE Mrs. Astor. It was recently sold and is now a private home. I always enjoyed visiting there and experiencing the Victorian lifestyle.